Welcome to “Higher than the Mountains,” Camp Metigoshe’s high ropes course. 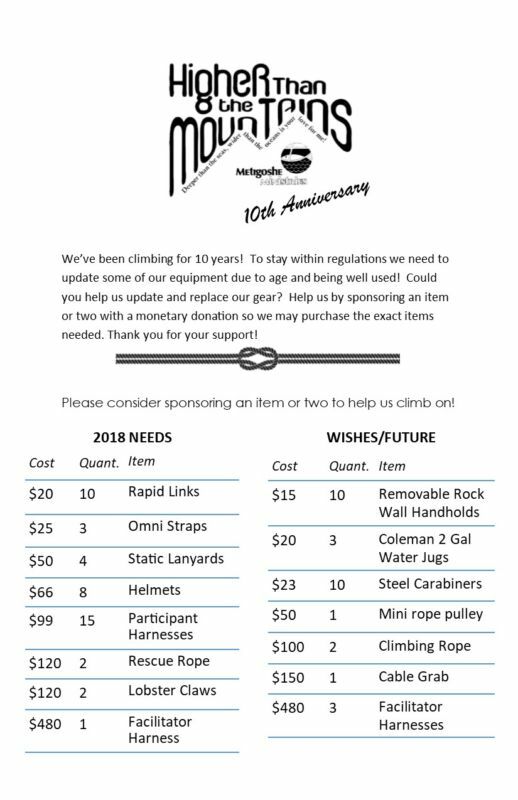 You can reserve the course by calling Jenn at 701-263-4788 or emailing highropes@metigosheministries.com. From half-day events to multi-day programs, we work closely with you to customize your experience on “Higher than the Mountains” to fit your needs and goals. Please go to the photo gallery to see pictures of Camp Metigoshe’s premier course that includes a zip line over 300 feet long, spectacular views of pristine lakes and the aspen forest, and nearly 20 different elements calling upon individuals and teams to challenge themselves and grow together. The course name comes from a camp song that is a reminder of God’s ever-present love, “Higher than the mountains, deeper than the seas, wider than the ocean is Your love for me.” Of course, at 35 feet in the air, one is also, very literally, higher than the mountains—the Turtle Mountains that is. Who Should use a High Ropes Course? Note: Participants must be 13 years old to climb.